In celebration of Liger, the juicy pale ale collaboration of Tin Roof and Gnarly Barley Brewing, the 'Big Cats & Hazy Beer' event runs 4 p.m. to 10 p.m. Friday at Tin Roof Brewing, 1624 Wyoming St. There will be live music and food by Rock Paper Taco and Barbosa's BBQ. At long last, football is back. After an eight-month drought, the pigskins are once again flying, which means tailgate season is here, too. And since tailgates mean beer, a couple of local breweries have released beers to mark the occasion. Baton Rouge’s Tin Roof Brewing and Hammond’s Gnarly Barley Brewing are two among a handful of Louisiana breweries that brew officially licensed collegiate beers for their respective hometown universities. 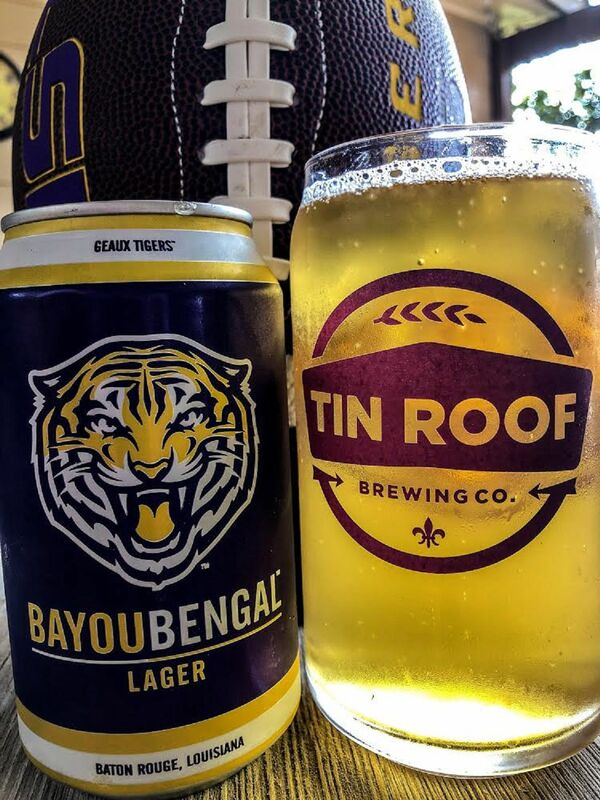 Tin Roof has tweaked the recipe for its Bayou Bengal pale lager, which was recently released just in time for football season. This year’s version is lighter, more drinkable and slightly easier on the wallet. Similarly, Gnarly Barley released this year’s Lion Up, a collaboration with Southeastern Louisiana University, in mid-August. This American wheat ale is refreshing and features floral and citrus notes from the use of Amarillo hops. An easy drinker at 4.5-percent alcohol by volume (ABV), Lion Up is available at the brewery’s taproom and around Hammond. Since LSU is hosting Southeastern in its football home opener on Saturday, Sept. 8, the two breweries naturally decided to create a collaborative beer. Since big cats are the mascots at both schools, the obvious name of the beer was a combination of the two — Liger. This juicy pale ale weighs in at 5.5-percent ABV and was brewed with Galaxy, Mosaic and Citra hops. Liger was brewed at Tin Roof and will be released on Friday, Sept. 7, in the taproom, with another party planned for gameday Saturday. Friday’s festivities get underway at 4 p.m. with music from Kirk Holder and Chuck Pierce, as well as food from Barbosa’s Barbecue and Rock Paper Taco. It’s also Family Friday, with inflatable bounce houses and face painting to occupy the kids. The taproom will open at 10 a.m. on Saturday with music from Delta Revelry beginning at 2 p.m. The football game will be shown on a projector on the patio, as well as on the televisions inside the taproom. Huntsville, Alabama’s Straight to Ale brews are now available in south Louisiana. Founded in 2009, Straight to Ale has become one of the largest breweries in the state of Alabama. Among the beers available here are Monkeynaut IPA, Brother Joseph’s Belgian Style Dubbel Ale and He Ain’t Heffe, a German-style Hefeweizen. Look for Straight to Ale beers in cans at your favorite specialty grocer and bottle shops around town.